Number 20, our second house of 1979, was a project of another sort—the customers specifically asked for less aging. At the time, the idea of aged miniatures was still new. The buyers wanted to display the house in their miniature shop, and held the notion that their customers might be repelled by the presence of dirt, bird poo and dry rot. In retrospect this seems like antiquated thinking, considering the number of houses collected and classes taken due, in large part to our aging and distressing techniques, not to mention the gallons of our Bug Juice aging solution the shop sold, but the customer is always right, so we went to work on cleaning up our act for The Gray’s River. Another incongruity in their request lies in the name, though I don’t think we planned it that way. Gray’s River, WA is a small, rural town, featuring a gracefully aging Victorian farmhouse overlooking an even more aged covered wooden bridge, both of which helped inspire our efforts to highlight the effects of time and weather on old structures. 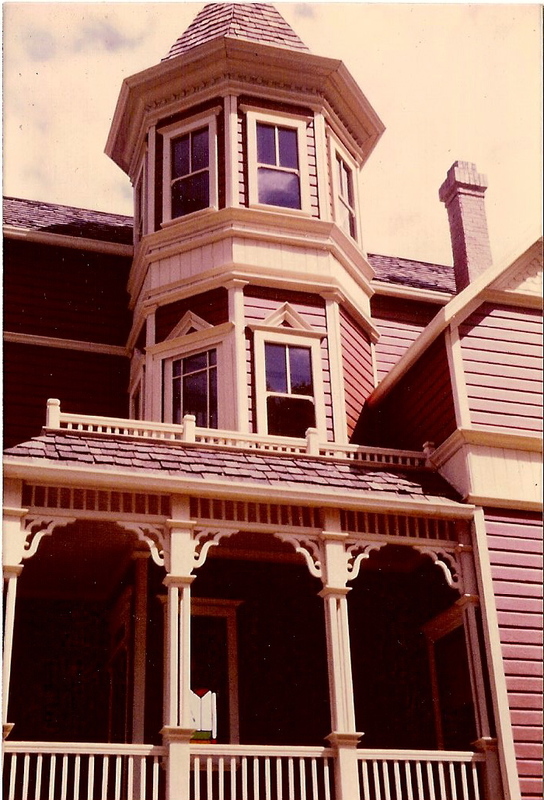 Our structures were not neglected, or tumble-down houses, but reflected the natural ravages of time, while being maintained and repaired along the way. Slope slant and sag is what gives them their stories, reminding the viewer of an old house in the town where they grew up, or their grandparents lived in. Age is familiar, immediately and involuntarily involving the observer. It is part of what we like to call the illusion of reality. 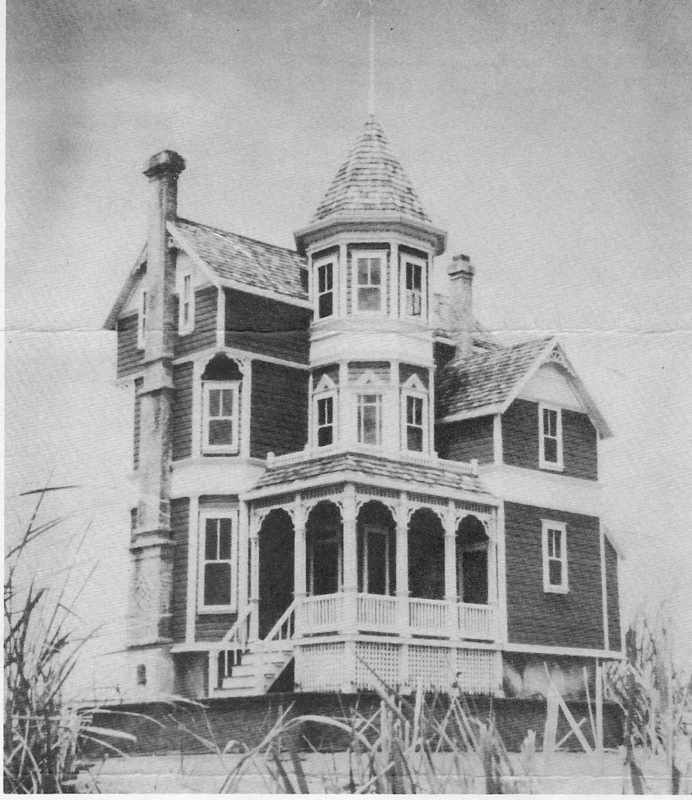 The Gray’s River also became the basis for the design of our Tower House shell, one of the series of unfinished shells (or kit houses) we designed for do-it-yourself-ers. These were built for us by Ray Urh, who adapted the design to fit efficiently on 4′ X 8′ ply, and take standard manufactured doors, windows, and etc. They were distributed through Mr. Peepers Miniatures in Seattle. Early on, we had learned that the kit business took too much time away from our finished work. A local woodworker was eager to build the shells, which we then packed for shipping in re-built washing machine cartons. While we knew enough to design houses to fit through our narrow doors, we neglected to remember that the boxes would make them bulkier. I packed them in the living room, by the front door, paring down the boxes as much as possible. It was Noel’s job to get them out the door, one way or another, until the day one wouldn’t. No amount of pushing, pulling or shoving would pop it through. Noel was feeling irresistibly Gonzo that day and made a run at it from the dining room, through the living room and into the air until shoulder met box, the immovable object. After that we were thrilled to pay someone else to deal with the kits, and that Noel still had a shoulder. The Gray’s River is now owned privately, but it may be for sale. Please let me know if you’re interested. Unfortunately the best pictures of it have been lost, but these few show the basics. Time has aged the photos probably less kindly than the house itself. 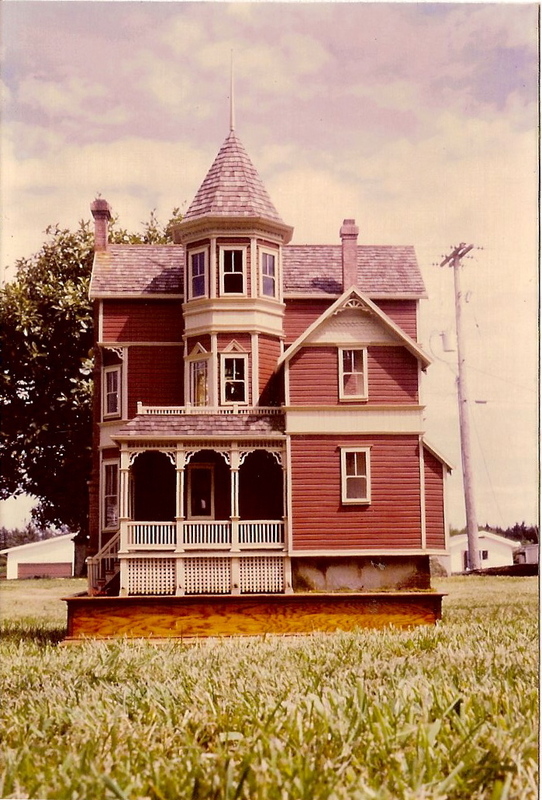 This entry was posted in Houses, Miniatures and tagged collectors, dollhouses, Victorian architecture, work style. Bookmark the permalink. Hi Nathaniel, For more information on what’s for sale, please see our website at http://www.thomasopenhouse.com and stay tuned to this blog, where I’ll be posting things for sale as we clear out our studio and workspace, plus alert you to more of our work that comes up for sale. I recently purchased a doll house with a plague on it that says Tower House # 31 designed by Noel Thomas built by Ray Urh 1981. I purchased it in Kansas City and just love it. Can you tell me what I have? I can send pictures if you tell me where to send it. Hi Becky, You have a kit we designed (I hope it was a plaque, not a plague! ), that was built by Ray Urh. I don’t know who bought or finished it to whatever state it is in. Hope you enjoy it! Hello Pat, I have recently acquired one of the tower kit houses in all its unfinished glory. I plan to use your techniques to finish the house. It is signed on the bottom but no longer has its base with the brass plaque or any of the extras. I would like to know if you still have the dimensions for the base and any picture or which way the stairs were orientated.